Finger Lakes white wine tasting tonight! 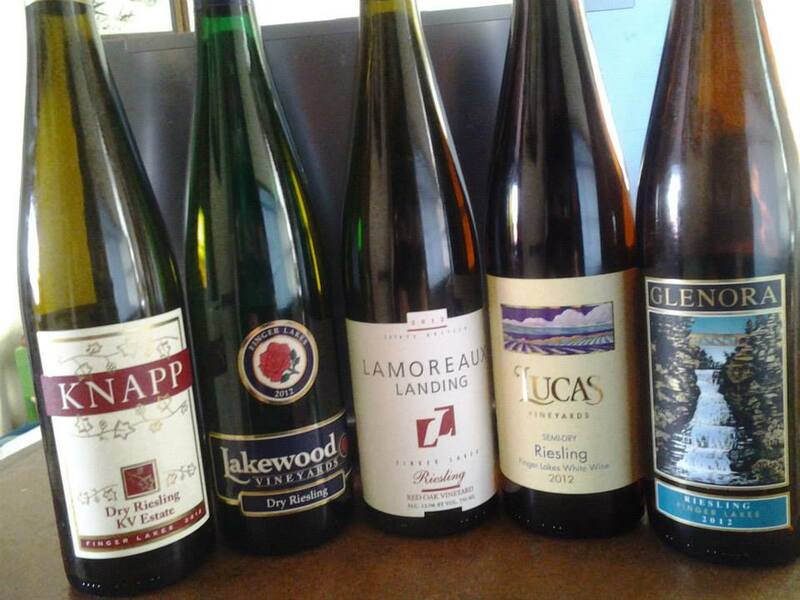 Finger Lakes Riesling Launch 2012 – The line up. I’ve been lucky enough to be invited to participate in a Finger Lakes white wine tasting tonight, my second time after last spring. While back then, the Finger Lakes were still an exotic wine destination for me, I have now tried more and more of its wines and am quite impressed, so tonight’s line up including Chardonnay, Gewuerztraminer and Rieslings should be fun! The tasting happens on Twitter at 9:00pm EST and you can follow it via the hashtag #winechat (it takes place under the auspices of Protocol Wine Studio (@ProtocolWine), which skilfully hosts #winechat every week). I did some research on the Finger Lakes last year, and figured it was helpful to read through it again, so I am reposting this. May is Finger Lakes Wine Month, so why not give their wines a shot? The Finger Lakes region became an officially recognized American Viticultural Area (AVA) in 1982 and consists of approximately 4,451 hectares (11,000 acres) that are operated by around 100 wineries. The main glacial lakes that make up the area are Canandaigua Lake, Keuka Lake, Seneca Lake and Cayuga Lake. These (and other lakes) stretch from North to South just South of Lake Ontario which explains their name: Finger Lakes. Apparently, the first vines were planted in 1829. The Finger Lakes really seem to have taken off when the above mentioned Dr. Konstantin Frank (a Ukrainian immigrant with a PhD in plant science) started experimenting with roots and grapes varieties there for Cornell University in the 1950s and 60s. His work proved to be the first that enabled wine makers in the North Eastern United States to grow European grape varieties, in a climate and area that had been deemed off limits for these grapes. What is interesting about the region is that the lakes lie at different heights, with land surrounding Canandaigua Lake reaching up to 2,000′ in height, with the land between the lakes further to the East successively reaching lower heights of 1,500′, 1,300′ and 800′. So this should actually make for different micro climates and therefore perfectly situated for single vineyard wines. The region’s dominating grape varieties by acres under vine are mostly North American usual suspects: Concord (1,814 acres), Catawba (811 acres) and Niagara (667 acres). However, the Finger Lakes region’s second most planted variety is Riesling with 828 acres under vine. The climate should be favorable to Riesling and other varieties grown in colder climates like Germany. Actually, if you look at data gathered by Cornell University in the summer of 2012 (which also provides the other numbers), there are many obscure German or Austrian varieties planted in the area: from Zweigelt to Siegerrebe to Geisenheim to Dornfelder. Disclaimer: The wines were received as media samples from the Finger Lakes Wine Alliance. Opinions are all my own. But to the wines. I have written about the region previously, so feel free to check out this post that I wrote for the Finger Lakes Wine Month back in May. We had a couple of friends over, I made my Korean spicy-braised potatoes and later we moved on to cheese that our friends had brought. We tasted the wines in order from driest to sweetest, as suggested by the Alliance. The 2012 growing season is generally described as warm and pretty dry, which led to a lot of sugar in the grapes. Ultimately, this can lead to higher levels of alcohol in the wine. All wines were made with 100% Riesling grapes. We started off with the 2012 Knapp Dry Riesling Estate KV. The winery was founded in 1984 and is located at Cayuga Lake tending to 40 acres under vine. The grapes for this wine came from one 1.5 acre plot (single vineyard, yay!!) called Block 11. The wine has 12.5% ABV, only 182 cases were produced, $18.95. It is a collaboration between the vineyard manager Christ King and the winemaker Steve DiFrancesco. The wine poured in a light yellow color with a sweetish nose of peach, white grape and lemon aromas. The nose prepared me for a semi-sweet wine (it just smelled so sweet), but fortunately the wine definitely tasted dry. It was citrussy and tasted quite nice. Very clean tasting, refreshing. This wine definitely reminded me of a German Riesling. There were slight, slight bitter aromas at the end which were no problem though. Nina thought it was more a feinherb-tasting wine (meaning a drier semi-sweet), but I disagree. To me, it was dry. Definitely an impressive start. 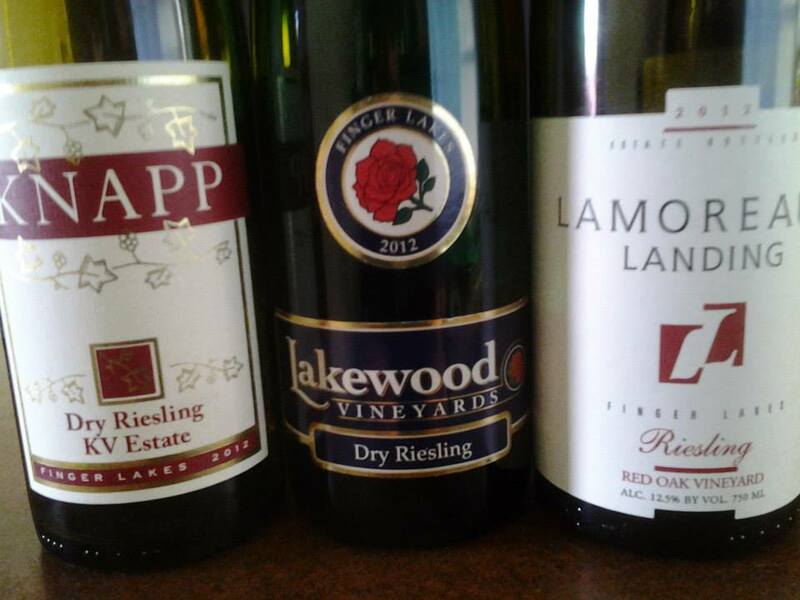 Next up was the 2012 Lakewood Vineyards Dry Riesling. Lakewood Vineyards Winery was founded in 1989, but grapes have been grown on this family-owned farm since the 1950s. It has 80 acres under vine, ten of them Riesling. The four different blocks of Riesling that were used for this wine were fermented separately and then blended in January. Bottling begins in April. The wine has 11.7% ABV, 810 cases were produced, $12.99. The winemaker is Chris Stamp, grandson of the farm’s founder. This wine’s color was lighter than the Knapp, very light yellow. Its nose was floral, with nectarine aromas being very prominent. It was a beautiful nose. On the palate, the wine seemed a bit heavier than the Knapp giving it a great mouth-feel. There was a nice amount of acidity with pear and sweet apple aromas. The middle part was the best in this wine for me. It just opened up and became wide with a hint of creaminess. The finish then surprised with citrus aromas coming in. This wine really worked for me. Front and middle section were very lovely, the finish was decent. Add in the price tag and you have a stunner! The last dry-labelled of the evening was the 2012 Lamoreaux Landing Red Oak Vineyard Riesling, another single vineyard wine. Lamoreaux Landing is run in the third generation, with holdings on Seneca Lake. The wine has 12.5% ABV, 400 cases produced, $19.99. In the glass, this Riesling was extremely light in color, almost looked as clear as water (I was surprised by how light the color of the first wine was, but we kept going lighter and lighter). The nose was screaming peaches at me. Peaches, peaches, peaches. Great nose, very fresh, too. I was excited. On the palate, though, this light-bodied wine was somewhat less impressive. The flavors were subdued, just some slight pear and strawberries. There was a tad too much heat for my palate. After half an hour it got a bit milder. I was somewhat disappointed by this wine. Maybe it came in the wrong spot after the very flavorful Lakewood, but it just did not seem very aromatic to me, which is something I want in a Riesling…tweets from other writers suggest that they really liked this wine. Don’t get me wrong, I didn’t think it was bad. It was just not aromatic enough for me. We then entered the semi-sweet zone, one of my favorite zones in Riesling. I just think that some amount of residual sugar really helps bring out the aromatics. So I was excited to try the next two. First up was the 2012 Lucas Vineyards Semi-Dry Riesling. The winery is located at Cayuga Lake and has been around since 1980 tending to 32 acres of vines, only 5 acres being Riesling. The winemaker is Jeff Houck, the wine has 11.4% ABV, $13.99. I am not sure whether my bottle was flawed, but this wine did not work for me at all. The nose was weirdly devoid of fruit and same goes for the taste. Just nothing seemed to be coming together. I will therefore not comment on this wine. The final wine was the 2012 Glenora Wine Cellars Riesling. The winery was the first on Seneca Lake, and the wine was also made by Steve DiFrancesco, the winemaker of the first wine. The grapes came from three different farms around Seneca Lake. 2,600 cases were produced and the wine has 12% ABV, $13.99. During the tasting in May, we had the chance to try a Glenora Gewürztraminer which I found pretty flavorful. The wine poured in a lighter yellow color. The nose was pretty, with honey, sweet apple and tropical fruit aromas. I liked it. Maybe a bit too much honey for a wine that is supposed to be medium-sweet, but pretty. 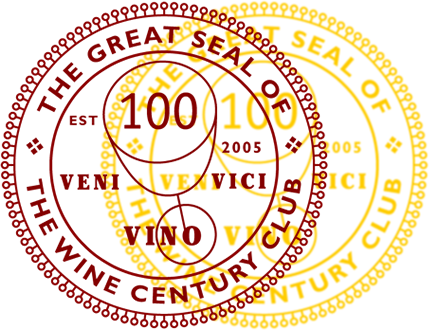 On the palate, the medium-bodied wine first showed its 12% ABV. That was a bummer. Aroma-wise, it was great with papaya and pineapple. There was some acidity, but I wished there was more of it. The finish felt a bit flat, with bitter aromas and petrol. This wine started out nicely, the aromas were there, the weight was there. But then I feel like the alcohol took over. I wish it had clocked in at maybe 10.5% or so, with the added sugar, ok, but that might have brought a bit more balance. I can see that the lack of acidity was another problem, so at 10.5 it might have ended up tasting too sweet. A conundrum, for sure…this wine is still very young, so maybe it will need some more time to get the flavors together and for the alcohol to integrate better. All in all, I was most impressed by the dry wines with the Lakewood being the standout wine here. That just worked for me. Light and flavorful, just like a dry Riesling should be. The Knapp was also a strong showing. The Lamoreux I will have to retry on its own one of these days. I really feel like it might have been harmed by the depth of flavors in and direct comparison with the Lakewood Riesling. This outcome was a surprise for me, given how much I prefer the medium sweet Rieslings in general. But that, to me, is also testament to the quality of these Rieslings…Finger Lakes Rieslings are definitely worth trying out. 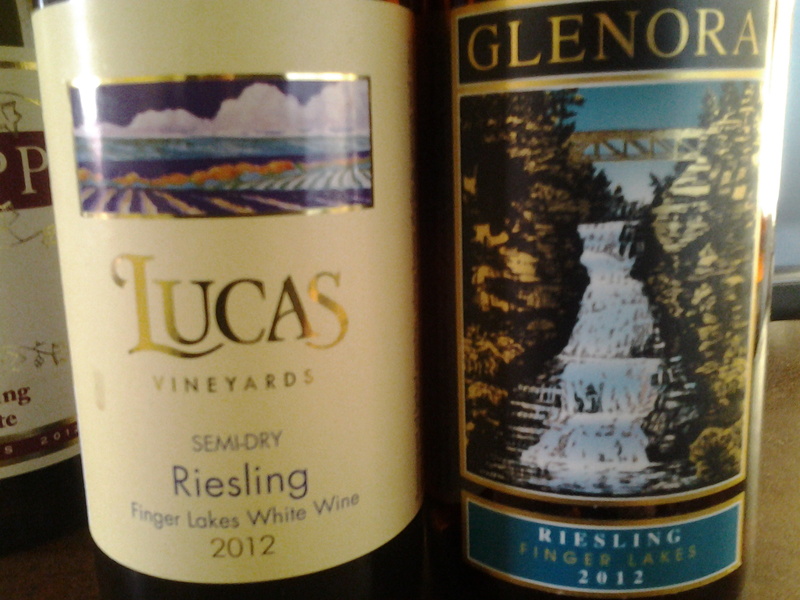 I will be participating in the Finger Lakes Wine Alliance 2012 Riesling Launch virtual tasting on September 16. The tasting will be conducted from 8pm until 9pm EST via tweets on Twitter and a live stream on USTREAM, where a panel consisting of the participating wineries’ winemakers will answer questions. The hashtag is #FLXWineVT. Come join if you find the time! The participating wineries are: Knapp Winery, Lakewood Vineyards, Lamoreaux Landing Wine Cellars, Lucas Vineyards and Glenora Wine Cellars. I have been doing some reading preparing for the tasting (and the wines have arrived at my house courtesy of the Finger Lakes Wine Alliance) and I found the article I want to share today one of the best reads. It gives a good introduction into what Finger Lakes wine country feels like and what current trends and ideas are. I have yet to visit the area, so I don’t know how true the impressions are, but they helped me in better understanding what is going on. Happy Sunday, and come join the tasting tomorrow!